Featuring the world famous u.s. air force thunderbirds! additional performers — coming soon! Please take a few moments to check out the great line-up of world-class performers below! New performers may be added leading up to the show, so be sure to check back here for the latest additions. 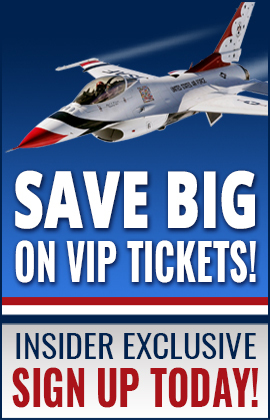 Become an Air Show Insider and be the first to get updates! Please note: Performers are subject to change without notice. If there are any changes, we’ll do our best to let you know. Thank you! 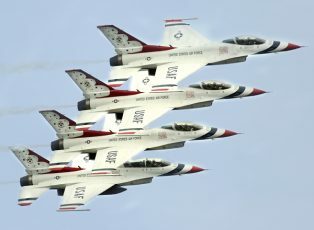 As the world’s premiere aerial jet demonstration team, the Thunderbirds have the honor of representing nearly 700,000 active duty, Air Force Reserve, Air National Guard, and civilian Airmen across America and deployed around the world. They fly the F-16 Fighting Falcon in a patriot and awe-inspiring aerial performance. Team Fastrax™ owns and routinely performs with the Largest American Flag ever flown under a parachute. Measuring at over 7,800 square feet, our largest American Flag can be seen for more than 35 miles when flown. We have the industry’s largest inventory of more than fifteen American flags. The flags range in sizes from 250, 500, 1100, 1800, 2000, 2500, 5000 and 7800 square feet. No team in the world has big flag jumping experience like Team Fastrax™. We have flown with precision as many as ten flags at once. 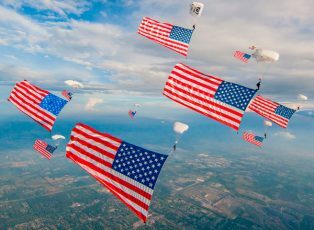 Our flag jumping performances are a fan favorite at events ranging from NASCAR, IndyCar, Football, Soccer, and Baseball to Concerts, Festivals, Celebrations, and other Patriotic or Veteran gatherings. 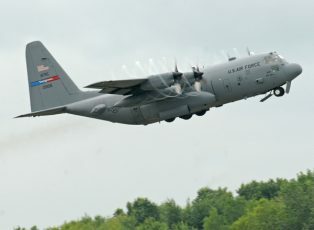 The 910th is authorized and assigned eight Lockheed C-130H Hercules transport and cargo aircraft. This demonstration will feature the 910th’s tactical airlift and cargo drop mission. 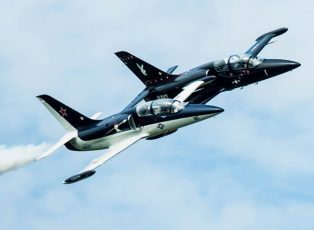 The aircraft can carry more than 36,500 pounds to include six pallets of cargo or 64 paratroopers or 74 litter patients or 92 combat troops or a combination of any these up to the cargo compartment capacity. It can land on unimproved or dirt airstrips of less than 3,000 feet in length. It may also accomplish strategic airlift of personnel and supplies at distances in excess of 3,000 miles. Shockwave is a custom built race truck equipped with 3 huge J34-48 Pratt & Whitney Jet Engines originally out of the USA Navy T2 Buckeye. The combined horsepower is 36,000! These 3 Jet Engines make a total of 21,000 lbs of thrust which easily propels this truck to speeds over 350 mph while racing planes at air shows all over North America! 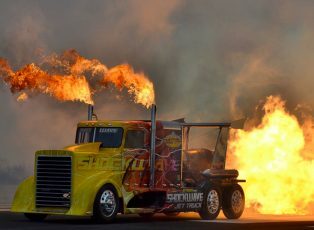 Shockwave is not only the most powerful truck in the world, it also hold the record speed for Semi Trucks at 376 mph! As one of the most popular air show and drag racing exhibition vehicles in the world, the Shockwave performance is not something you will soon forget! This is truly an assault of all of your senses with huge flames coming out of the 3 after burning jet engines, fire shooting out of the smoke stacks, intense heat, deafening noise, and SPEED! Shockwave is owned by Darnell Racing Enterprises, Inc based in Springfield, MO and driven by Chris Darnell. 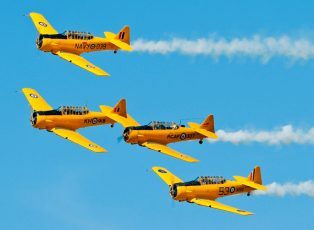 The Canadian Harvards are a professional 4-plane demo team that specializes in low-level formation aerobatics and bringing history to life. 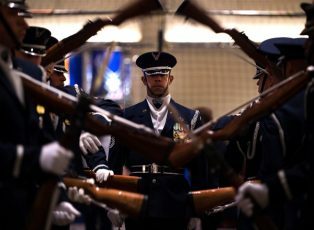 Their high-energy routine highlights what can be achieved through passion and teamwork. Buckle-up for LOTS of SMOKE & LOTS of NOISE! 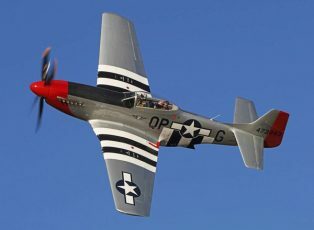 The CAF Red Tail Squadron restored and flies this rare P-51C model Mustang fighter to create interest in the story of the Tuskegee Airmen, who flew P-51s just like it during WWII. The red tail and the sound of the powerful Merlin engine ensure a crowd will gather wherever the Mustang appears at an air show. Commemorative Air Force B-17 "Texas Raiders"
Texas Raiders was delivered to the U.S. Army Air Force July 12, 1945 and since 1967 has been owned by the CAF, a non-profit, educational association based in Midland, Texas. 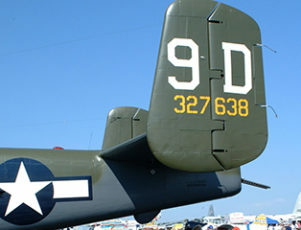 The Flying Fortress now resides at Hooks Airport in Spring, Texas where maintenance, restoration and operations are conducted by a dedicated volunteer crew. 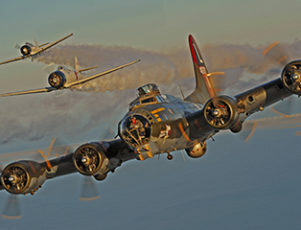 This B-17 has been described as one of the most authentically restored B-17s flying today. The North American B-25 “Mitchell” Bomber was one of the most versatile and widely used aircraft and considered the best medium bomber of the Second World War. Over 11,000 were produced with a wide number of variations and armament configurations. The F-4 is undoubtedly one of the most important military aircraft in the history of the United States. The Phantom first took flight in 1958 and quickly set 25 world records in categories like speed (mach 2.6) and altitude. 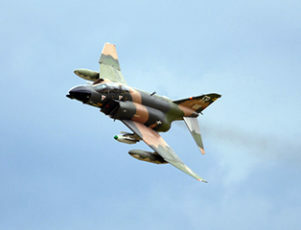 Due to the impressive performance of the aircraft, the Navy, Air Force, and Marine Corps all utilized the F-4. Made famous by the Vietnam War, the MiG-17F was the primary enemy aircraft engaged in the skies over Vietnam by U.S. aircraft, such as the A-4,A-7, F-8, B-52, F-100, F-105 and its primary nemesis, the F-4 Phantom II. During that war and up until the F-16 entered service, it was the tightest-turning fighter in the world. When production started in the 1950s, its VK-1F engine made it one of the first production jet fighters in the world with an afterburner. 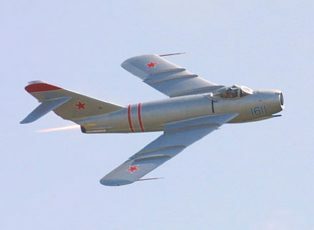 The MiG-17F could carry bombs, rockets, or extra fuel tanks under its wings. 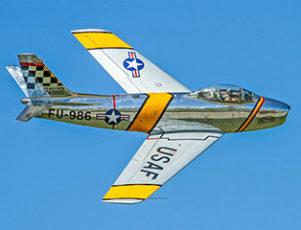 The North American F-86 Sabre was designed in the 1940’s as a subsonic fighter aircraft. The Sabre entered service with the United States Air Force in 1949. The F-86 saw action and became the primary U.S. air combat fighter in the Korean War. Various models were produced in day fighter, fighter-bomber, and all-weather interceptor configurations with a variety of armaments. U.S. production of the Sabre ended in Dec., 1956.